"Sugar pie, honey-bunch...I can't help myself..." The Four Tops, 1965. Sharing food, in an archival sense, dates back at least 40,000 years to cave paintings in the Paleolithic Era. Romans, Egyptians, and Mayans all documented the food they ate, and sometimes even how they prepared it. Renaissance and impressionist painters took a liking to still life, painting food in bowls or adorning tables fit for kings. “Food is one of the most social things we do as people — preparing food, presenting food, consuming food — these are very cultural and social actions, things we do with chosen family.” Humans are driven to archive and share history. And food makes up a significant portion. As millions sit down to dinner, it’s inevitable that one of you, perhaps even more than one, will break out your smartphone and start snapping pictures of your plate and if they’re lucky, maybe even those who are sharing it with you. You’ll agonize over filters, tap out a clever caption, and hit the share button only to realize you forgot the hashtags. You’ll find the edit button, add a handful of related terms, and save the post, hoping nobody noticed the oversight. Food has always been a part of the human condition. Sharing food, in an archival sense, dates back at least 40,000 years to cave paintings in the Paleolithic Era. Romans, Egyptians, and Mayans all documented the food they ate, and sometimes even how they prepared it. Renaissance and early impressionist painters took a liking to still life, painting food in bowls or adorning tables fit for kings. Interest in food as art only grew from there with modern masterpieces from the likes of Andy Warhol, who found inspiration in the most unlikely of places: a Campbell’s soup can. In a modern sense, the trend in documenting your next meal can be tied to two defining moments. The first is the ubiquity of smartphones. (Ironic, considering the device we once bought to facilitate conversation is now the gadget we rely on to avoid it.) Whereas once we might have picked up the phone to talk about a great meal, now we’re snapping a photo of it and hoping this conversation plays out in the form of hearts or other emoji. It’s a recent shift, with the first passable smartphone cameras not making an appearance until the early 2000s. Arguably, the first “good” camera phone didn’t show up until 2007, with Nokia’s 5-megapixel shooter, the N95. Still, capturing a photo was only half the battle, amateur shutterbugs also needed a reliable way to upload it (and a place worth sharing it). The stars began to align in 2010, with the launch of Instagram. By then most of us had a passable camera in our pocket, mobile internet speeds fast enough to upload our creations, and a place tailor-made for sharing them. That’s saying nothing of filters that gave the illusion of photographic proficiency. Modern food photography, from there, began its ascent. 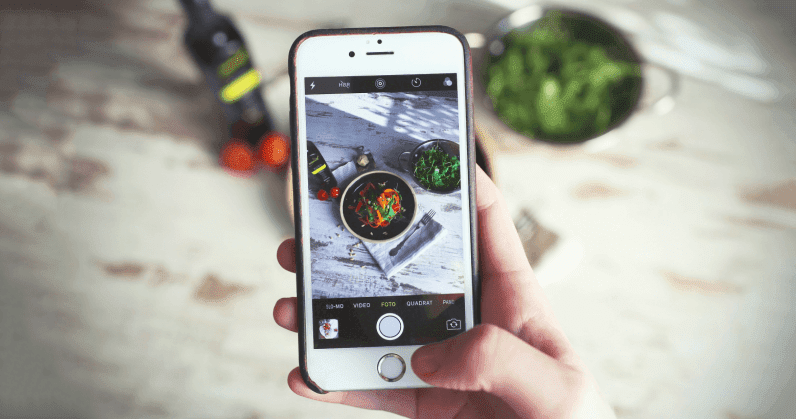 In 2013, social media users employed the #food hashtag on Instagram some 800,000 times. Just five years later, the number ballooned to more than 306 million — or, nearly 840,000 images a day. The second big moment actually started more than a decade prior, in 1997. It was then that Six Degrees — an homage to the idea that two people can be connected through no more than six friends or acquaintances — introduced the world to social networking. The rise of social networking is important, but not for reasons immediately apparent. Sure, Six Degrees led to better networks that adapted and iterated the concept, leading to the social media platforms we recognize today. But while Myspace, Facebook and others laid the groundwork, it was Twitter that broke the mold. With just 140 characters to communicate, internet users were introduced to the idea of brevity. Gone were the rambling blog posts of the early 00s, replaced with quick-hit content that users could fire off in mere seconds. Users were quick to embrace the concept. From there, others pushed the limits even further. New platforms like Instagram, Pinterest, and Snapchat later sprouted, ushering in a world where, for the first time, words were completely optional. And with this change came a desire to show, rather than tell. For the first time, we were living in public. And not just with friends and family. Many of us started connecting with complete strangers from around the globe. We founded tribes, or networks of people with shared interests. Most importantly, we attempted to convey an image of life that might not be entirely in line with the one we were actually leading. According to one expert I spoke with, Alexandra Boutopoulou, a visual social media researcher at the University of Sheffield, the implications in this shift are numerous. For some, sharing food photos is an effort to document the rich social or cultural traditions surrounding food. For others, it’s merely a tool used to attract likes or follows — though not necessarily for reasons other than curating an audience of other passionate foodies. Still others are attempting to capture a memory they can share with friends and loved ones, an opportunity to cement a moment much as we would an architectural masterpiece or a sunset. Humans, by their nature, are driven to archive and share history. And food makes up a significant portion of this history; it connects us not only to our earliest ancestors, but our more immediate family and friends. So why are we obsessed with sharing pictures of our food? Because it’s decidedly human. It brings us all a little closer, if only through a shared appreciation of our best meals. Or maybe you’re actually a narcissist.